Before you get started it may be interesting to know that Youtube works with Flash video (extension .flv). This does not necessarily make it harder to download or so, but if you plan to edit the video yourself, then flash video files present you with more problems than you probably want. Therefore, you’ll find in this blog not only ways to download flash films, but also to convert them to more easy file formats, such as quicktime, avi, mpeg, and the likes. MediaConvert is a free webservice that converts not only audio & video, but also textfiles to other file formats. The only thing you need is a browser -no extra software is required, you don’t even have to register on their site. MediaConvert is fairly simple and easy: navigate to a file on your harddrive or enter the internet location of the doc you want to convert, select the in- and output format and click on submit. When the conversion is ready, you’ll get a mail in your mailbox containing a download link. And that’s it! MediaConvert can handle files up to 150 Mb, and that is probably the only limit. This service can handle practically any file format, going from popular video file formats (3G2, 3GP, AMV, ASF, AVI, DPG, DV, FLI, FLV, GIF, GVI, MKV, MOV, MP4, MPG, NSV, OGM, RM, SWF, VOB, WMV), audio formats (WAV, WMA, 3GP, MP3, OGG, AAC, AMR, FLAC, MPC, MMF, AU, AIFF, QCP), more than 60 graphical file formats, compression formats (7Z, BZ2, BZA, CAB, GZ, LHA, LZH, RAR, TAR, TGZ, YZ1, ZIP) and documents from such suites as Office, OpenOffice, Lotus 123, html, qhtml and what have you. Do you want to convert pdf to swf? No problem. An Access database to an Excel sheet? Piece of cake man! YouConvertIt and Zamzar are very similar one stop-services where you upload a document (or enter its URL), choose the desired file format and where you receive a downloadlink in your mailbox. Both services are completely free and do a good job in converting the most popular file formats. Let’s start with Youconvertit. 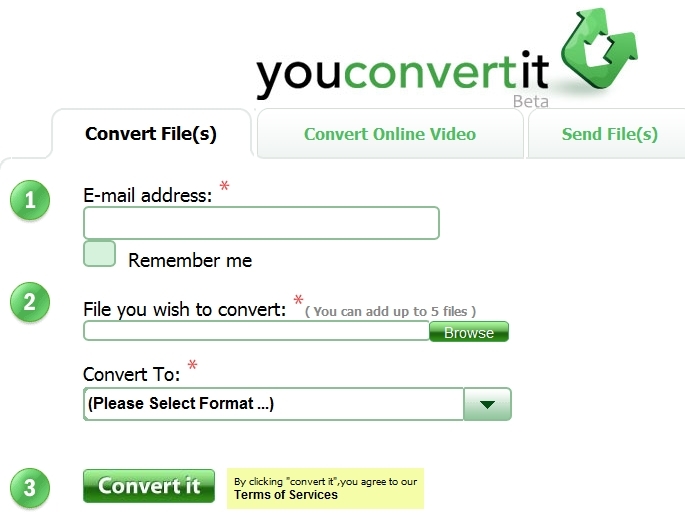 Youconvertit.com can tackle audio, video, pictures or other file formats. The procedure is extremely simple: select the file on your pc, choose a file format, and click the button “convert it”. Once everything’s ready, you’ll receive a mail with a download link that will last for about 7 days. Youconvertit can work with 8 audio formats (AAC, MP3, WAV,..) 72 image formats (JPG, GIF, PNG, …), 13 video formats (AVI, WMV, 3GP, MP4, …) and 46 other file formats (DOC, PDF, …). You can convert up to 5 files simultaneously. 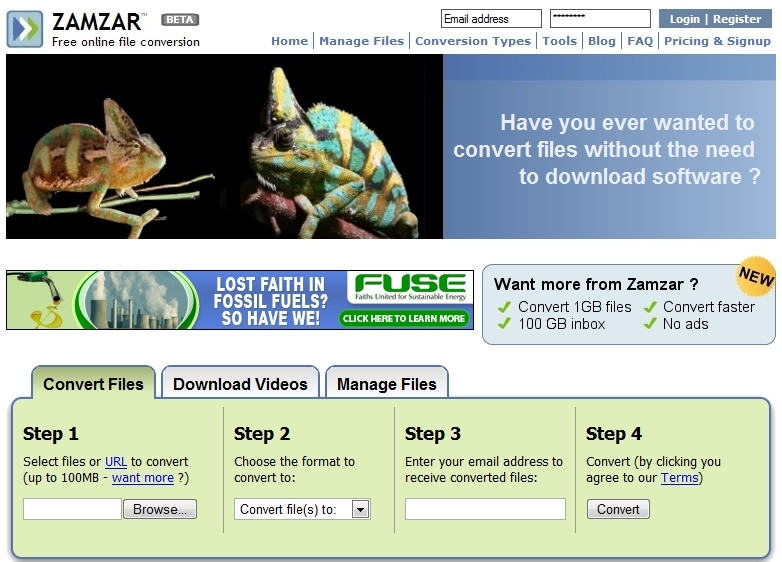 What sets Youconvertit.com apart from MediaConvert or Zamzar is that here, there’s no ceiling to the file size. If you want to download films from Youtube, Metacafe or Google, click on “Convert online video” at the top of your screen, enter the URL of the film and choose the target file format. Just like the others, Zamzar is a free conversion service that can convert video, audio, pictures or other documents to other file formats. Here too, you can convert up to 5 files simultaneously. The procedure is identical to the others, except for the fact that Zamzar only keeps the converted file 24 hours on their hard drive, so you’ll have to be quick! Another disadvantage, if you ask me, is Zamzar cannot handle files larger than 100 Mb. If you register, however, you can upload files up to 1 Gb -and that’s a lot of bandwith if you ask me, but still, it is possible. Zamzar too can handle the most frequently used file formats. If you want to convert films from Youtube, then, in “Step 1”, you’ll first have to click on URL and paste the URL of the youtube film. Steps 2, 3 & 4 are foolproof. If you want to download Youtubefilms, or if you have a quicktime movie that you’ll have to convert to mp4, then these web services are perfect for you. Forget the Firefox plugins -these conversion services are not only much faster and easier, they also offer qualitative output. If you ask me, MediaConvert gets bronze; Zamzar & Youconvertit have much more eye candy and are a close match. Because they keep the converted files a bit longer, and because there’s not limit to the file size, my personal gold medal goes to Youconvertit. But let’s face it, Zamzar, how cool a name is that! Here is a simple way to download from YouTube without tha help of any grabber. check this too. ghent as in the ghent in belgium? i’ve visited ur university before! very beautiful.